Recently I came across Masyu, which has all the appeal of Slitherlink but is just a bit different. It's still a loop-based game, so it fits with Kwon-Tom Loop, right? Having exhausted Nikoli's sample puzzles and failing to find any decent software generator, I wondered if Kwon-Tom Loop might start providing Masyu puzzles. I know I'm asking a lot. Thanks! It has lots of puzzles, including Masyu. The site is in German but you should be able to find your way around. I second this suggestion. I'm German, so if you don't understand something on the site, just ask me. (technically, though, the site is Austrian). I recommend trying to solve puzzles by their difficulty rating - that way, you can start learning a new puzzle type with very easy, almost trivial puzzles, and then the difficulty gradually increases as you solve more and more puzzles. Thanks for the www.janko.at tip. Masyu is a great game. I've played a few of the puzzles and I like them! As to putting them on here, it's a nice idea and if I can find enough time I might have a go... however, with a new baby about to arrive in the family in two weeks I might just have my hands full for a while!! Haha, yes I played those and I liked them, just be wary Foilman, or you will end up with Sudoku and every other Asian named logic puzzle on here. Not that I'm against it, but it might be a little much for you from the sound of it. That having been said, there are surprisingly few good sites for these games and I just know that you could improve upon them, so if you do have the time, I'm all for it. 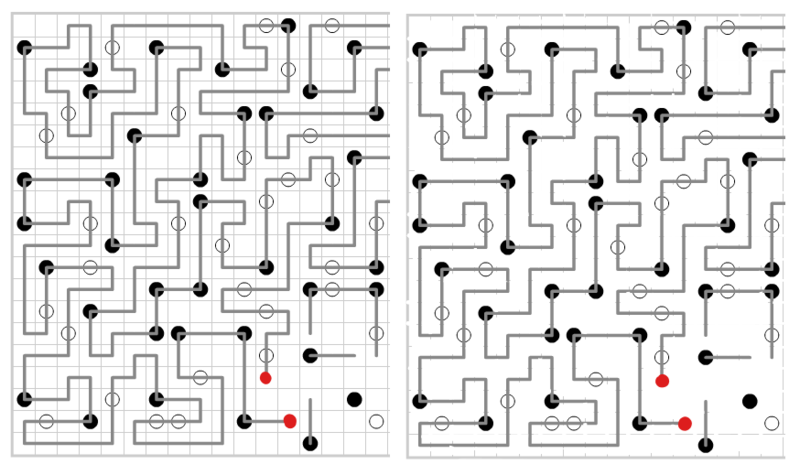 The slitherlinks and crosslinks are easy (compared to the puzzles here), but the other ones are interesting. Thanks for the link. These puzzles look pretty interesting, but they obviously have the drawback of not being solvable online (like on janko.at or here at kwontomloop.com). How do you actually solve these puzzles? Do you print them? Do you use programs like Microsoft Paint to simply scribble the solution onto the image (e.g. on this one)? How do you actually solve these puzzles? Do you print them? I think two of them I ended up copying to graph paper (I don't have a printer). Do you use programs like Microsoft Paint to simply scribble the solution onto the image? This is what I did for the rest, but with GIMP. You can also try puzzlepicnic.com if you want to play more online. There's a whole bunch of blogs with nikoli style puzzles. http://mathgrant.blogspot.com/ features a whole bunch of Masyu, just named differently. Some of his are also found on puzzlepicnic in an online format. Yes I personally was downtrodden by the lack of accomodation of crosses. Although the puzzles are, in my oppinion, easier to solve without crosses than slitherlinks, the harder ones could use the feature. I hope to actually make it generate puzzles which are not only solvable, but have a controllable level of difficulty in the next couple of days, but for now it has a chance (<10%?) of giving you a solvable puzzle, displayed as Brian suggests (which I think is the best way). (I'm calling my implementation Twist'N'Turn)� I'd keep working on it tonight but I have google code jam in an hour. Unfortunately, I'm on Ubuntu which doesn't support Silverlight. Moonlight works with some sites, but apparently not yours, Tilps. But I'm sure others will have fun with your program. Yeah, I'm using silverlight 4 - moonlight is only silverlight 3 compatible even using the latest beta. They claim they will have alpha silverlight 4 compatibility by the end of the year. If you made this generator like a slitherlink generator where you first draw a loop and then check if it forms a unique Masyu puzzle I can inform you that that isn't the way to go. You prob discovered the main problem in that, which is that not every loop has a unique Masyu puzzle opposed to slitherlink where almost every loop has a unique puzzle in it. It's probably one of the reason there aren't any Masyu generators out there already. The only way I can imagine it working is a generator that places balls one by one and checks if there still is a solution and keeps going till it finds a unique one. Creating Masyus is really a deductive path and has very little hope of being unique with a recursive path. I never liked these total Masyu puzzles where all balls are given and when there is no ball neither is true. The path always has this set curving path through open areas without a ball. Kinda predictable. ps. I don't agree that the normal grid lay out is bad. If you give someone a square grid and ask them to draw a loop in it, most people will draw a loop that goes through the centers of squares opposed over the lines of a grid. The reason this is done different in slitherlink is because of the way the clues are given. Also you can easily use crosses as you can just put a cross on a line to indicate that line isn't crossed by the loop. 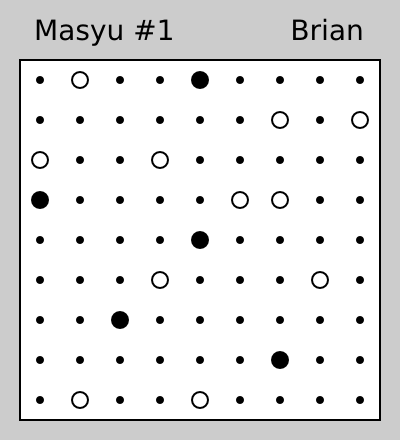 Puzzlepicnic.com has crosses implemented in their script for Masyu. ps. I don't agree that the normal grid lay out is bad. If you give someone a square grid and ask them to draw a loop in it, most people will draw a loop that goes through the centers of squares opposed over the lines of a grid. But that's not the alternative I'm proposing. 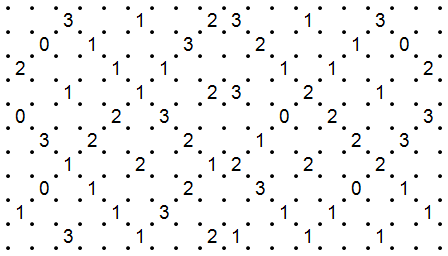 I want to use dots instead of a grid. It's hard for me to see how the grid's useful in any way. I may try a build up generator rather than a tear down, but since there are so few clues to potentially remove, the cost of repeatedly generating loops until you get one which sticks is probably fine for smaller grids. I guess I'll find out later. My silverlight version is now generating actual solvable puzzles, generation time is acceptable for grids of size 6x6, 8x8 is pretty slow. For the moment the puzzles are pretty easy, some of the game rules aren't even properly programmed in the logic solver, just in place by virtue of it refusing to close the loop if the puzzle is not correctly solved. Once I get the game rules in more fully, I'll go back and look at making the generation faster.